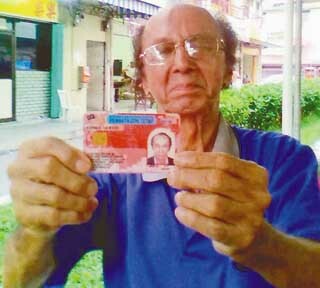 Former Dalit Village Security and Development Committee Chairman, Justin Emran, wants an explanation as to why he was issued a red MyKad when he went to change his old one recently. "I went to have my old IC changed, but I am shocked to find that they gave me a red one. "Am I worse than a foreigner? Because from what I observed, the foreigners in Keningau could get their MyKad in just three months," he claimed. "What surprises me more is that it is written 'originally from Malaysia', but why a red MyKad?" he asked. Justin also claimed that about 10,000 foreigners now have their own MyKads. "I hope the Malaysian Anti-Corruption Commission will investigate this," he said. He also hoped Pensiangan Member of Parliament Tan Sri Joseph Kurup as well as Sook Assemblyman Datuk Ellron Alfred Angin will take note of this issue and come up with a solution.